January 20th has become a day when women come together to advocate for transformative social change, initially started in protest of the then-newly elected President Donald Trump and anti rights wave taking over power in America in 2017. Trump’s first day in office was January 20th, 2017 and the next day, women and supports of women’s rights took to the streets of Washington and many US cities to take part in the largest protest in the country’s history . Many other protests were held in cities in other parts of the world to show solidarity. In case you wonder why the Women’s March on Washington is of any interest to African feminisms, you might not have followed his campaign closely. One of Trump’s first decisions was to bring back the Global Gag Rule, a Reagan-era document that cut off US family planning assistance funds to foreign non-governmental organizations (NGOs) that perform abortions or even mention the option of legal abortion. It is one of the biggest assault on women’s sexual reproductive rights. One might argue that abortion is already illegal in many African countries and few others allowed under some exceptions like life of a mother. Trump’s version of the policy expands the restricted funds beyond family planning assistance to include all US ” global health assistance,â€ according to a piece by Quartz which looked at the impact of the policy on Ugandan mothers. A participant at Women’s March Kampala. Photo by Prudence Nyamishana. This is just one of the many reports on that show the devastating consequences of this policy for women and girls especially where governments do not substantially cover the reproductive health services, and worse for those in countries who mostly rely on non governmental organisations to step in and close the gap. Indeed in my own country Uganda, American government supports a huge percentage of our healthcare system and many women heavily rely on organisations like Marie Stopes International, Reproductive Health Uganda, PATH and others to get informed on choice of family planning as well as access. So while events in Washington may look far from our realities, the election of a rogue president with zero respect for women’s rights has direct consequences on our rights – as do his anti-immigration rhetoric and policies which affect a lot of African families and women. Somehow that’s how the world currently operates, and a movement to promote women’s rights, equality, diversity, and inclusion should be studied and supported. His widely recent reported racist rhetoric calling African countries shithole countries was met with fury and ridicule on the continent which shows why this particular American president can’t be ignored by those working in the rights spaces on the continent. This embolden power to disrupt and destroy lives must be protested and challenged. Such a show always has implications on populist and nationalist fronting regimes who see a hero in him. So when I saw a Facebook event titled Women’s March Kampala mid-January, I clicked the ‘interested’ button. Besides, a lot of people I knew had indicated interest. The event was to be held on January 20th as part of the commemoration of the first protest and to reiterate that women are still fighting and still here to reclaim their rights. I was really excited and thought yes Ugandan women were connecting these dots and joining many other cities in the world to protest Trump, the fascism, right wing politics and anti women’s rights stances that were gaining ground across the world. After all, studies are already showing impact of his policy on organisations at the heart of reproductive rights here. The chief speaker was Hon. Justice Elizabeth Nahamya, International Crimes Division, High Court of Uganda. This pulled me further into the event and so did the line up of several Ugandan organisations. My questions on how a march was possible in a city/country that took back the right to peaceful protest back in 2013 using the Public Order Management Act were answered on the Facebook events page. The march would actually be a rally and I remember cursing at how we Ugandans have been left with little room to organise and associate. On the morning of January 20, I jumped on a boda-boda to avoid the Saturday traffic and arrived at the event fashionably late. The chief guest was already speaking with just a little over 50 people in audience, majority foreign. Visibly clear there were not enough Ugandan women and women’s rights supporters to march my expectations on the true reflection of Women’s March, Kampala. However I stayed on and managed to catch the beautiful poetry recital of Beverley Nambozo Nsengiyumva Dress me in disobedience. Rashida reading Beverley Nambozo Nsengiyunva poem. This event brought forth the key challenge of balancing online and offline mobilisation for movements. Few organisations listed online showed up – when they did, it was just a few staff members. A few minutes in it, it was clear that the Women’s March Kampala had little to do with Kampalan/Ugandan women organising and connecting to the movements on the global stage. As commendable as it is, any hosting or organising an event connected to such cause should take a little more work than set up a Facebook event page. A representative of the organisation that I could identify told me they had been ‘brought on board’ a few days before. Had Ugandan women’s rights and human rights organisations on the list committed but only bailed on the final day? I do not know but watching Justice Nahamya speak to a small audience loosely fitting in the big playground at Naguru Hilltop composed of mainly expats couldn’t have made the missed opportunity clearer. Any efforts to protest internationally must go extra mile to be anchored in local efforts, especially in Uganda where the women’s movement has historically crossed race and religious boundaries in its organising. The women at the forefront of challenging power and patriarchy in the locale would add more legitimacy and the point of the connected nature of the struggle for women’s rights in the world. Especially a protest against a president that is racist and on the roll to actualise white supremacy fantasies. The response to him therefore ought to be much more diverse than what I witnessed at Women’s March Kampala. However for movements to be indeed global they have to be challenged, changed and adapted to fit and reflect our diverse contexts. The Global Gag Rule was used by President George Bush and just like today, health services were scaled back at a time. Closure closure of reproductive health clinics left some communities with no health care provider as reported in Kenya, Ethiopia and Zambia. So if marches are organised only among people who can ably afford the services that Trump policies deny many women and girls in countries like Uganda, that is falling short and not taking the opportunity of the moment. Over the last years Uganda has seen a tremendous improvement in family planning and reproductive health with contraceptive prevalence rate (CPR) rising from 30% in 2011 to 39% in 2016. However today 28% of Ugandan women have an unmet need for family planning. With US government still being the biggest financier of our health budget, such disruptions brought about by the Global Gag Rule are a wake up call for our own government to find sustainable models of funding sexual reproductive rights. Until that happens we will continue to grapple with uncertainty that comes with heavy reliance on aid. Protesting Trump’s policies impact on African women and girls can happen along side debate on reducing dependency on aid for such key sectors. Such debate requires women with diverse experiences to be included in marches and protests. This rally’s aim of showing “a progressive alliance across the world, built by individuals, groups and communities who together will be the voice of a new global consciousness” left a lot to be desired. I hope the next Women’s March Kampala or many other efforts to connect struggles of women in Uganda to the world are better organised to reflect the diversity after all Uganda is one of the most diverse countries in the world. Rosebell is a writer, digital communication strategist, public speaker and award-winning blogger. Her experience spans journalism, new media, rights in crisis, migration, women's rights, peace and security issues- mostly in Africa. 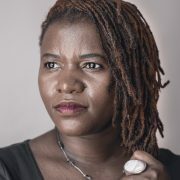 In the past she has worked with various Ugandan media and as stringer for various international media outlets. She was recently a Social Media Manager for the International Organization for Migration (IOM). The World Economic Forum also recognized her among Young Global Leaders under 40 for 2013. She blogs at Rosebell's Blog which won the Waxal - Blogging Africa Awards, the first African journalist blogging awards hosted by Panos Institute of West Africa in 2009.